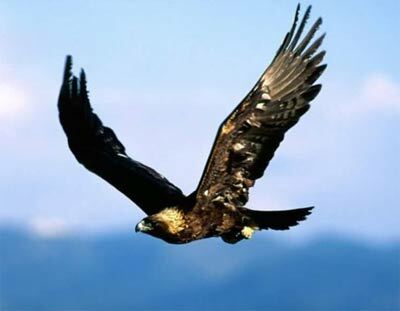 Last summer while my father and I were extracting honey at the apiary about a mile southeast of Thacher School, Ojai, California, we noticed a golden eagle teaching its young one to fly. It was about ten o’clock. The mother started from the nest in the crags, and roughly handling the young one, she allowed him to drop, I should say, about ninety feet, then she would swoop down under him, wings spread, and he would alight on her back. She would soar to the top of the range with him and repeat the process. One time she waited perhaps fifteen minutes between flights. I should say the farthest she let him fall was 150 feet. Some other good commentary on the subject can be found here. Thank you for this! I want to research this more, the internet has several denials of this act of the mother.. I was glad to see this. I love the TRUTH of every scripture. Thanks again.